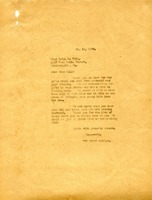 List of companies including bakery, hosiery, candy, and shoe stores located in Atlanta, GA, New Jersey, and Vermont. 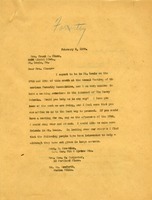 The Berry Schools writes to Helen R. Gill to thank her for the gifts that she and her friends sent as well as the list of names that she provided to be placed on Berry's mailing list. The Schools also wish to express their condolences at Miss Gill's recent illness and hopes that her condition is improving. 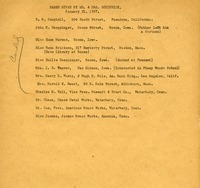 A list of donations from individual DAR chapters, including their locations and the names of their presidents. 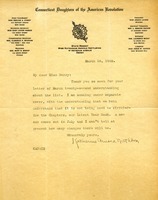 Letter to Martha Berry from Katherine Arnold Nettleton thanking her for her letter and understanding about the list. She informs Miss Berry that she is sending under separate letter with both of their understanding that it is not being used to "circularize" the chapters. Concerning their newest year book, she informs Miss Berry that the new one comes out in July of that year but that she can't possibly tell how many changes will be made to it. 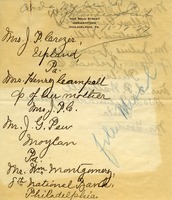 Martha writes to Mrs. Glass with a list of donors who have given to the Berry School and asks if she might be able to arrange for Martha to meet with them when she is visiting St. Louis. 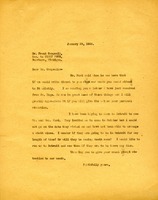 Martha Berry sends a letter to Mr Campsall, written by Mr Hoge, that details the current needs at The Berry Schools because Mr Ford had instructed her to do so for prompt attention.